Property management firms have grown in numbers over the years because they offer many benefits, but every advantage comes with an added price. As long as your rental income is good, you can afford property management firms and they can even help you increase it, which makes it even better. As long as you have a good rental income, you can afford property management films and they can help you increase your income. However, this is only if you hire the right property manager, and if you do it wrong, it can have very serious consequences. What exactly is a property management company? You can decide if a property management firm is suitable for you or not only when you know what it is about. A property management firm is a third party whom you can appoint to handle the day-to-day operations and activities on your rental units. No matter whether your property is single-family housing or multi-family apartments, a property management firm will be able to control and supervise. Such a company is responsible for a number of tasks, the exact details of which depend on the amount you agree to pay to them. What is a property management firm responsible for? A property management company can do a number of tasks on your behalf. Here is a look at the main ones of them. A property manager can decide the initial rents for new tenants. They will also collect the rent and adjust it whenever increments are due. A property manager can market your rental units and search for suitable tenants. Once they find suitable candidates, they screen them through a rigorous hiring procedure and only then close a deal with them. As a landlord, you will often have to deal with tenant issues. A property management can take this burden off from your shoulder and handle all their complaints in a timely manner. How can you decide if you need a property management firm or not? There are several things which you can consider while evaluating if you need a property management firm or not. Consider the number of properties you have rented out. If this is more than two or three, you will face problems in managing all of them properly. Should this be the case, hire a property manager and you will reduce your burden. There are many landlords whose rental income is not the only source of their earnings because they are involved in another business or are employed elsewhere. In all these situations, you can really not expect to devote the time that is required in managing properties, and so appointing a firm is actually a great decision. As already mentioned, a property management company can be a costly venture, especially if you are just starting out. Determine your financial position and opt for one only if you can bear the added costs. What fees are charged by property management firms? 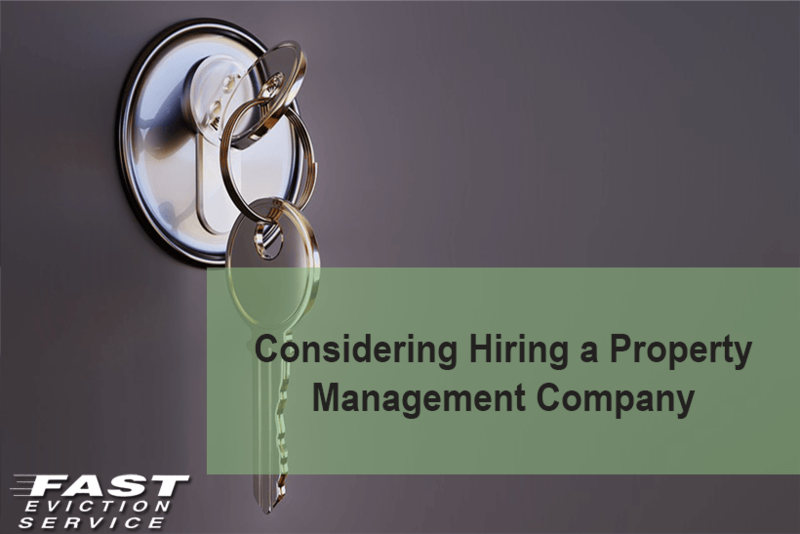 The exact costs of hiring a property management firm depend on the tasks that you want them to conduct. Generally, they charge around 10% for single family houses and around 4% to 7% for multi-family residences. These percentages are evaluated on the basis of rent due or rent collected; go for the latter option so that you do not end up losing a significant amount of money. At times, some companies also charge an additional amount for extra services such as tenant placement, adverting, evictions and so on. A property management firm can provide you with many benefits, the primary ones of which are highlighted below. A property manager appoints tenants only after following a very thorough screening procedure, which may not be easy for you to implement. This provides you with better tenants who stay longer, pay in a timely manner and avoid damaging your property. A property manager is well aware of the laws of the landlord-tenant industry, and so can ascertain that you follow them. This will prevent you from getting caught up in legalities. A property management firm can keep your property in well-maintained conditions and promptly handle all tenant complaints.